"Universal Records" redirects here. For Universal Records 1988-1989, see Universal Records (1988). For Universal Records 1995-2005, see Universal Records (1995). For other uses, see Universal Records (disambiguation). Universal Music was once the record company attached to film studio Universal Pictures. The company's origins go back to the formation of the American branch of Decca Records in September 1934. The Decca Record Co. Ltd. of England spun American Decca off in 1939. MCA Inc. merged with American Decca in 1962. In November 1990, Japanese multinational conglomerate Matsushita Electric agreed to acquire MCA for $6.59 billion. In 1995, Seagram acquired 80 percent of MCA from Matsushita. On December 9, 1996, the company was renamed Universal Studios, Inc., and its music division was renamed Universal Music Group; MCA Records continued as a label within the Universal Music Group. In May 1998, Seagram purchased PolyGram and merged it with Universal Music Group in early 1999. With the 2004 acquisition of Universal Studios by General Electric and merging with GE's NBC, Universal Music Group was cast under separate management from the eponymous film studio. This is the second time a music company has done so, the first being the separation of Time Warner and Warner Music Group. In February 2006, the label became 100 percent owned by French media conglomerate Vivendi when Vivendi purchased the last 20 percent from Matsushita. On June 25, 2007, Vivendi completed its €1.63 billion ($2.4 billion) purchase of BMG Music Publishing, after receiving European Union regulatory approval, having announced the acquisition on September 6, 2006. Doug Morris stepped down from his position as CEO on January 1, 2011. Former chairman/CEO of Universal Music International Lucian Grainge was promoted to CEO of the company. Grainge later replaced him as chairman on March 9, 2011. Morris became the next chairman of Sony Music Entertainment on July 1, 2011. With Grainge's appointment as CEO at UMG, Max Hole was promoted to COO of UMGI, effective July 1, 2010. Starting in 2011 UMG's Interscope Geffen A&M Records will be signing contestants from American Idol/Idol series. On January 2011, UMG announced it was donating 200,000 master recordings from the 1920s to 1940s to the Library of Congress for preservation. In March 2011, Barry Weiss became chairman and CEO of The Island Def Jam Music Group and Universal Republic Records. Both companies were restructured under Weiss. In December 2011, David Foster was named Chairman of Verve Music Group. In 2011, EMI sold its recorded music operations to Universal Music Group for £1.2 billion ($1.9 billion) and its music publishing operations to a Sony-led consortium for $2.2 billion. Among the other companies that had competed for the recorded music business was Warner Music Group which was reported to have made a $2 billion bid. IMPALA opposed the merger. In March 2012, the European Union opened an investigation into the acquisition The EU asked rivals and consumer groups whether the deal would result in higher prices and shut out competitors. On September 21, 2012, the sale of EMI to UMG was approved in Europe and the United States by the European Commission and Federal Trade Commission respectively. However, the European Commission approved the deal only under the condition the merged company divest one third of its total operations to other companies with a proven track record in the music industry. UMG divested Mute Records, Parlophone, Roxy Recordings, MPS Records, Cooperative Music, Now That's What I Call Music!, Jazzland, Universal Greece, Sanctuary Records, Chrysalis Records, EMI Classics, Virgin Classics, and EMI's European regional labels to comply with this condition. UMG retained The Beatles (formerly of Parlophone) and Robbie Williams (formerly of Chrysalis). The Beatles catalogue was transferred to UMG's newly formed Calderstone Productions , while Williams' catalogue was transferred to Island Records. Universal Music Group completed their acquisition of EMI on September 28, 2012. In November 2012, Steve Barnett was appointed chairman and CEO of Capitol Music Group. He formerly served as COO of Columbia Records. In compliance the conditions of the European Commission after purchase of EMI, Universal Music Group sold the Mute catalogue to the German-based BMG Rights Management on December 22, 2012. Two months later, BMG acquired Sanctuary Records for €50 million. On November 8, 2012, Universal Music and Hewlett-Packard launched a marketing operation that allows customers with an HP computer with HP Connected Music software to access music from Universal artists, as well as exclusive content. On February 8, 2013, Warner Music Group acquired the Parlophone Label Group (consisting of Parlophone Records, Chrysalis Records, EMI Classics, Virgin Classics and EMI Records' Belgian, Czech, Danish, French, Norwegian, Portuguese, Spanish, Slovak and Swedish divisions) for $765 million (£487 million). Later in February, Sony Music Entertainment acquired Universal's European share in Now That's What I Call Music for approximately $60 million. Play It Again Sam acquired Co-Operative Music for £500,000 in March 2013. With EMI's absorption into Universal Music complete, its British operations will consist of five label units: Island, Polydor, Decca, Virgin EMI and Capitol. In April 2013, Universal Music Greece (excluding Nana Mouskouri) was sold to Victoras Antippas, who renamed the company Cobalt Music. Edel AG acquired the MPS catalogue from Universal in January 2014. On March 20, 2013, UMG announced the worldwide extension of their exclusive distribution deal with the Disney Music Group, excluding Japan and Russia. As a result of this deal DMG's labels and artists have access to UMG's roster of producers and songwriters on a worldwide basis. The exclusive deal also saw UMG granted unlimited access to all rights pertaining to Disney's 85-year back catalog of soundtracks and albums. On April 1, 2014, Universal Music announced the disbandment of Island Def Jam Music, one of four operational umbrella groups within Universal Music. Universal CEO Lucian Grainge said of the closure, "No matter how much we might work to build 'IDJ' as a brand, that brand could never be as powerful as each of IDJ's constituent parts." Under terms of the agreement Island Records and Def Jam would operate as autonomous record labels. David Massey and Bartels, who worked respectively at Island and Def Jam Records, would lead the new record labels independently. Barry Weiss, who previously moved from Sony Music to head up Island Def Jam Music in 2012 when Motown Records was incorporated into Island Def Jam, stepped down from Universal Music. Additionally, as part of the changes to the labels, Motown Records would transfer to Los Angeles to become part of the Capitol Music Group and previous Vice President Ethiopia Habtemariam was promoted to Label President for Motown Records. Republic Records would operate independently while the Interscope Geffen A&M group remained unchanged. Universal Music Group entered into film and TV production with the 2014 purchase of Eagle Rock Entertainment. UMG's first major film production was Amy while taking part in Kurt Cobain: Montage of Heck and The Beatles: Eight Days a Week documentaries. In January 2016, UMG hired David Blackman from Laurence Mark Production where he was president of production as head of film and television development and production, and theater producer Scott Landis as special advisor on theatrical development and production. UMG Executive Vice President Michele Anthony and Universal Music Publishing Group Chairman and CEO Jody Gerson have oversight of the pair. On February 11, 2017, PolyGram Entertainment was relaunched as a film and television unit of Universal Music Group under David Blackman. Vivendi and Red Bull GmbH combined StudioCanal, Universal Music Group and Terra Mater Film Studios in a co-development partnership for feature films in May 2017. In August 2017, UMG and Grace/Beyond agreed to develop three new music-based television series, 27, Melody Island and Mixtape. 27 would focus on musicians at the age of 27, an age at which several iconic musicians died. Melody Island is an animated series based on uplifting tropical island feel music with live craft segments. Mixtape is dramatically structured similar to how a mixtape works with each connecting to a song. In December 2017, Universal Music Group acquired the catalogues of Stiff Records and ZTT Records, along with Perfect Songs Publishing, from Trevor Horn's SPZ Group. On July 30, 2018, Vivendi announced it was selling half of Universal Music Group. On November 19, 2018, singer Taylor Swift signed a new multi-album deal with Universal Music Group. In addition to the promised ownership of her master recordings, UMG agreed to, in the event that it sells portions of its stake in Spotify, distribute proceeds among its artists and make them non-recoupable. In February 2019, UMG fully acquired music distributor INgrooves. Universal Music Group co-developed Vevo, a site designed for music videos inspired by Hulu.com, which similarly allows free ad-supported streaming of videos and other music content. On May 24, 2018, Vevo announced that it would no longer continue distributing videos to Vevo.com, instead opting to primarily focus on YouTube syndication. 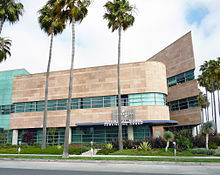 The UMG main global headquarters are located at 2220 Colorado Avenue in Santa Monica. The Santa Monica headquarters oversees its legal obligations in the US and Canada. Interscope-Geffen-A&M and Verve Music Group are based at its Los Angeles headquarters with John Janick heading Interscope-Geffen-A&M and David Foster heading Verve. 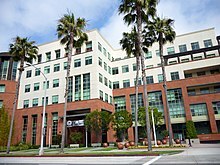 Def Jam, Island and Republic Records has offices at the Santa Monica headquarters. The building is also home to Universal Music Enterprises (UME). UMG chairman & CEO Lucian Grainge works out of the company's Santa Monica headquarters. Universal Music Publishing is headquartered at 2100 Colorado Avenue. The Capitol Music Group is headquartered at the Capitol Records Building in Hollywood. Tom Cage was assigned to the record label in 2004 after a short outing with A&M Records. Universal Music Group Distribution is headquartered in Universal City. Universal Music Latin Entertainment is headquartered in Woodland Hills. UMG has headquarters in New York City where Island Records, Def Jam Recordings, Republic Records, Decca Label Group, Spinefarm Records, and Geffen Records are headquartered. Universal Music Spain is headquartered in Madrid, Spain in the neighborhood of Ciudad Lineal. Universal Music Spain was founded in 1998 and today is important for both Spanish and Latin American artists, and generally, global Spanish language music. Universal Music Group Global (formerly known as Universal Music Group International (UMGI)) is headquartered in Kensington, London. Global manages UMG's offices in most countries outside of North America. Universal Music GmbH, the German subsidiary, is headquartered in Berlin. It moved in 2002 from Hamburg to the district Friedrichshain at the river Spree. Universal Music Group‘s Universal Music Polska is located in Warsaw. Universal Music Group's Universal Music Canada is located in Toronto, in a former building that was the previous home to the Canadian subsidiary of MCA Records since 1970. Universal Music Group Nashville is headquartered in Nashville, Tennessee. Universal Music Group's parent company, Vivendi, is headquartered in Paris, France. In 2018, UMG signed a licensing deal with Facebook to allow users to use UMG music across its properties including Facebook, Instagram and Oculus. Between 1995 and 2000, music companies were found to have used illegal marketing agreements such as minimum advertised pricing to artificially inflate prices of compact discs in order to end price wars by discounters such as Best Buy and Target in the early 1990s. A settlement in 2002 included the music publishers and distributors; Sony Music, Warner Music, Bertelsmann Music Group, EMI Music and Universal Music Group. In restitution for price fixing they agreed to pay a $67.4 million fine and distribute $75.7 million in CDs to public and non-profit groups but admitted no wrongdoing. It is estimated suppliers/customers were overcharged by nearly $500 million and up to $5 per album which conflicts with proof of sale and purchase interests. In May 2006, an investigation led by then New York Attorney General, Eliot Spitzer, concluded with a determination that Universal Music Group bribed radio stations to play songs from Ashlee Simpson, Brian McKnight, Big Tymers, Nick Lachey, Lindsay Lohan and other performers under Universal labels. The company paid $12 million to the state in settlement. In May 2007, UMG was accused of abusing the Digital Millennium Copyright Act in order to quell criticism, by forcing YouTube to remove several videos which contained UMG's music. Eventually, UMG retracted its claims after being challenged by the Electronic Frontier Foundation. In the same year, UMG was accused of using the Digital Millennium Copyright Act to indiscriminately remove content related to the artist Prince, most notably a twenty-nine-second home video in which a child danced to one of Prince's songs. In April 2016, UMG had the audio muted of a video clip showing Katherine Jenkins singing the British national anthem. They claimed that "God Save the Queen" was a copyrighted song, and YouTube initially complied with this request, but later allowed the video to be viewed with the original audio track. In December 2007, UMG announced a deal with Imeem which allows users of the social network to listen to any track from Universal's catalogue for free with a portion of the advertising generated by the music being shared with the record label. Two weeks after the deal was announced Michael Robertson speculated on the secret terms of the deal and argued that ultimately this was a bad deal for imeem. This speculation lead to a flame war on the Pho digital media email list as imeem representatives denied his claims and dismissed his theories as unfounded. All traffic was redirected to MySpace after the company acquired Imeem on December 8, 2009. On December 9, 2011, Megaupload published a music video titled: "The Mega Song", showing artists including Kanye West, Snoop Dogg, Alicia Keys and will.i.am endorsing the company. The music video was also uploaded to YouTube, but was removed following a takedown request by UMG. Megaupload said that the video contained no infringing content, commenting: "we have signed agreements with every featured artist for this campaign". Megaupload requested an apology from UMG, and filed a lawsuit against the company in the United States District Court for the Northern District of California, on December 12, 2011. UMG denied that the takedown was ordered under the terms of the Digital Millennium Copyright Act, and said that the takedown was "pursuant to the UMG-YouTube agreement," which gives UMG "the right to block or remove user-posted videos through YouTube's CMS (Content Management System) based on a number of contractually specified criteria." The video was subsequently returned to YouTube, with the reasons for the UMG takedown remaining unclear. Lawyers for will.i.am initially claimed that he had never agreed to the project, and on December 12, he denied any involvement in the takedown notice. ^ "The Origin & Many Uses of Shellac by R.J. Wakeman". AntiquePhono.org. May 6, 2015. Retrieved April 16, 2016. ^ "US Decca LP Labels". HeroInc.0Catch.com. Daniels, Frank. 2003. Archived from the original on January 4, 2009. Retrieved March 20, 2008. ^ Rackmil, Milton R. (August 28, 1954). "Pioneers' Dream Becomes Reality With Decca". Billboard. Retrieved December 16, 2011. ^ "HITS Daily Double : Rumor Mill - A BRIEF HISTORY OF MCA RECORDS". HITS Daily Double. Retrieved April 1, 2019. ^ "Seagram buys PolyGram - May 21, 1998". money.cnn.com. Retrieved April 1, 2019. ^ Stone, Rolling; Stone, Rolling (January 22, 1999). "Hundreds of Jobs Lost in Universal Mega-Merger". Rolling Stone. Retrieved April 1, 2019. ^ Adegoke, Yinka (May 25, 2007). "Universal Music closes on BMG". Thomson Reuters. Reuters. Retrieved November 20, 2008. ^ "Universal to buy BMG publishing". News.BBC.co.uk. September 6, 2006. Retrieved November 25, 2007. ^ "Vivendi Appoints Lucian Grainge Chairman & CEO of Universal Music Group". Billboard.biz. March 9, 2011. Retrieved December 16, 2011. ^ "Universal Music Group International promotes Max Hole to Chief Operating Officer". Ifpi.org. March 15, 2010. Retrieved May 24, 2011. ^ "Pop & Hiss". Los Angeles Times. January 10, 2011. ^ Halperin, Shirley (March 17, 2011). "Barry Weiss Named Chairman/CEO of Island Def Jam And Universal Motown Republic Group". Billboard.biz. Retrieved December 16, 2011. ^ "Ethiopia Habtemariam Named Senior Vice President of Motown Records". Billboard.biz. August 10, 2011. Retrieved December 16, 2011. ^ "Citigroup Sells EMI in Parts for $4.1 Billion to Vivendi, Sony". Businessweek.com. December 8, 2009. Retrieved November 16, 2011. ^ "This page has been removed". The Guardian. ^ Joshua R. Wueller, Mergers of Majors: Applying the Failing Firm Doctrine in the Recorded Music Industry, 7 Brook. J. Corp. Fin. & Com. L. 589, 602–04 (2013) (describing the antitrust scrutiny surrounding the sale of EMI's recorded music division to UMG). ^ Sweney, Mark (September 21, 2012). "Universal's £1.2bn EMI takeover approved – with conditions". The Guardian. London. Retrieved September 21, 2012. ^ Ingham, Tim. "Universal's Capitol takes shape: Barnett in, Beatles on roster". Music Week. Retrieved February 28, 2013. ^ Sisario, Ben. "Universal Closes on EMI Deal, Becoming, by Far, Biggest of Remaining Big Three". Mediadecoder.blogs.nytimes.com. Retrieved December 30, 2016. ^ "FMQB: Radio Industry News, Music Industry Updates, Nielsen Ratings, Music News and more!". Fmqb.com. Archived from the original on February 17, 2013. ^ Ingham, Tim (December 21, 2012). "BMG buys Mute catalogue from Universal". Music Week. Retrieved December 22, 2012. ^ "Analysis: BMG Poised to Become a Top Indie Catalog Following Sanctuary Acquisition". Billboard.com. February 15, 2013. Retrieved February 28, 2013. ^ "HP Connected Music teams up with Universal". Digital Spy. ^ Sisario, Ben (February 8, 2013). "Warner Music Group Buys EMI Assets for $765 Million". The New York Times. Retrieved February 8, 2013. ^ "Warner to buy the Parlophone Label Group". Gramophone.co.uk. February 7, 2013. Retrieved February 28, 2013. ^ "Universal Music Sells Now! European Rights to Sony Music". Bloomberg.com. ^ [PIAS]‘s Co-op acquisition approved. Complete Music Update (March 26, 2013). Retrieved on July 16, 2013. ^ Universal Music UK Announces Launch of Virgin EMI Records. Billboard (March 18, 2013). Retrieved on July 16, 2013. ^ Κέρκης, Γιάννης. "H Cobalt Music "αγόρασε" την Universal Music Greece". Ogdoo.gr. ^ "Edel kauft legendäres Jazzlabel von Universal". Edel AG. Archived from the original on February 14, 2015. ^ Universal Music Group (March 20, 2013). "Universal Music Group (UMG) & Disney Music Group (DMG) Expand Agreement Globally". Prnewswire.com. ^ "UNIVERSAL MUSIC GROUP (UMG) & DISNEY MUSIC GROUP (DMG) EXPAND AGREEMENT GLOBALLY". Universalmusic.com. ^ Motown Records and EMI Gospel Announce Joint Venture: Motown Gospel | EURweb – Part 1. EURweb (April 2, 2013). Retrieved on July 16, 2013. ^ "Vivendi Declined SoftBank's Lucrative Offer for Universal". The New York Times. July 19, 2013. Retrieved December 30, 2016. ^ a b c d Sisario, Ben (April 1, 2014). "Universal Music Group Breaks Up Its Island Def Jam Division". The New York Times. ^ Chagollan, Steve (January 7, 2016). "Universal Music Group Taps David Blackman, Scott Landis for Film, TV Development and Production". Variety. Retrieved August 21, 2017. ^ Littleton, Cynthia (February 12, 2017). "Universal Music Group Revives Polygram Label for Film and TV Production". Variety. Retrieved August 22, 2017. ^ Tartaglione, Nancy (May 24, 2017). "Studiocanal, UMG, Terra Mater Pact For Pics; IMAX Adds Euro Screens – Cannes Briefs". Deadline. Retrieved August 22, 2017. ^ Otterson, Joe (August 21, 2017). "Universal Music Group Partners With 'Beat Bugs' Producers for Three New Music-Based Series". Variety. Retrieved August 22, 2017. ^ "Universal Music Acquires Iconic British Labels Stiff Records and ZTT". Billboard.com. ^ Keslassy, Elsa; Keslassy, Elsa (July 30, 2018). "Vivendi to Sell Up to Half of Universal Music Group". Variety.com. Retrieved December 28, 2018. ^ Wang, Amy X. (November 19, 2018). "Taylor Swift's New Record Deal Affects Thousands of Other Musicians". Rolling Stone. Retrieved November 26, 2018. ^ Willman, Chris (August 27, 2018). "Taylor Swift Stands to Make Music Business History as a Free Agent". Variety. Retrieved August 29, 2018. ^ Aswad, Jem; Willman, Chris (November 19, 2018). "Taylor Swift Signs New Deal With Universal Music Group". Variety. Retrieved November 19, 2018. ^ "Universal Music to Acquire Distributor Ingrooves in Move to Strengthen Commitment to Indie Labels". Billboard. February 12, 2019. Retrieved March 21, 2019. ^ "Universal to Create Hulu-like Music Video Site". Retrieved August 10, 2016. ^ Daly, Rhian. "Vevo to close website and mobile apps". ^ "John Janick to Succeed Jimmy Iovine as Chairman, CEO of Interscope Geffen A&M". Billboard.biz. May 28, 2014. Retrieved May 28, 2014. ^ "It's Official: David Foster Named Chairman of Verve Music Group". Billboard.biz. December 15, 2011. Retrieved December 16, 2011. ^ "Steve Barnett to lead Capitol Music Group". Latimes.com. ^ "Facebook and Universal Music Group's new partnership will allow for user-gen videos with licensed music, new social features". TechCrunch. Retrieved April 1, 2019. ^ "Universal settles payola probe". USA Today. May 11, 2006. Retrieved December 10, 2011. ^ "Universal Music Group Backs Off Claims to Michelle Malkin Video". Electronic Frontier Foundation. May 14, 2007. Retrieved December 16, 2011. ^ Lenz v. Universal Music Corp.
^ "They Are The People". April 22, 2016. Retrieved August 10, 2016. ^ Barnett, Megan (December 21, 2007). "Digital Music War Gets Dirtier". Portfolio.com. Retrieved December 16, 2011. ^ RIAA Label Artists & A-List Stars Endorse Megaupload In New Song December 9, 2011. Retrieved December 13, 2011. ^ Universal Censors Megaupload Song, Gets Branded a "Rogue Label" December 10, 2011. Retrieved December 13, 2011. ^ Megaupload threatens to sue Universal over YouTube video The Guardian (London), December 13, 2011. Retrieved December 13, 2011. ^ Megaupload to Sue Universal, Joins Fight Against SOPA December 12, 2011. Retrieved December 13, 2011. ^ UMG claims "right to block or remove" YouTube videos it doesn't own Ars Technica, December 16, 2011. Retrieved December 16, 2011. ^ File-Sharing Company Sues Record Label, for a Change New York Times, December 13, 2011. Retrieved December 16, 2011. ^ UMG, MegaUpload Case Gets Even Stranger; Will.i.am Says He Didn't Authorize A Takedown Techdirt. December 15, 2011. Retrieved December 17, 2011.